A lot of our cooler growing orchids are really enjoying the winter with cool damp nights and the gentle sunshine that filters into the greenhouse at this time of year. This is especially true of our masdevallias that are in rapid leaf growth as well as many of them coming into flower. 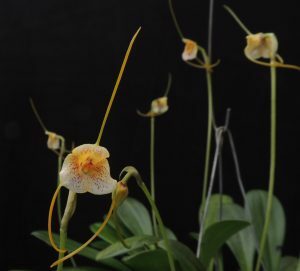 A winter masdevallia highlight is this small growing species native to Peru. 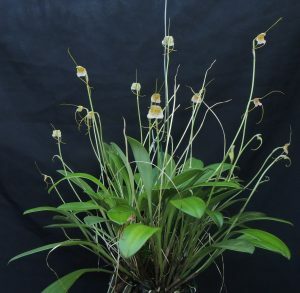 Masdevallia pandurilabia grows in cloud forest above 2600m altitude and loves it cool and moist with good air movement. Some species from similar habitats are a challenge to grow well in a greenhouse but this species seems to be a vigorous grower and as you can see from the photo on the left produces lovely glossy leaves too. We grow this species in baskets of bark and moss and give it a minimum of 10C.